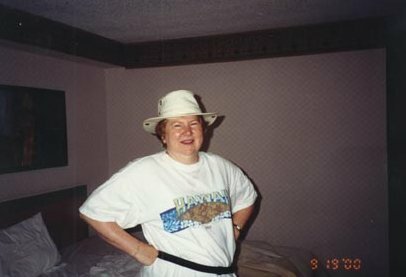 Diana is ready for a day of adventure. Today we're visiting one of the great engineering wonders of the world, Hoover Dam, but first we grab a quick breakfast at McDonalds. Then we catch the bus to the Las Vegas Convention Center. There we pay for the tour and get on the bus to the lake. Our tour is given by Guaranteed Tours. We select the Day Cruise. It includes a Lake Mead cruise, a tour of Hoover Dam, a buffet lunch and a visit to Ethel M's Chocolate Factory and Botanical Gardens. 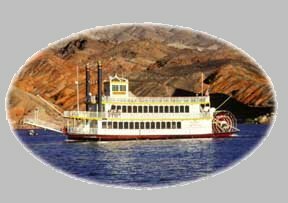 At Lake Mead, we board the Desert Princess, an authentic 300-passenger paddlewheeler built especially to cruise the blue-green waters of Lake Mead. Yep. This paddle wheel is functional. 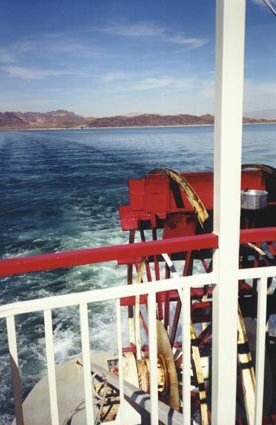 The Desert Princess is churning her way toward Hoover Dam. 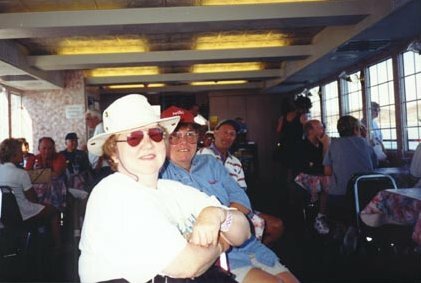 Diana, Sandy, and Harry relax in air conditioned comfort in the Desert Princess lounge. Here's our first view of Hoover Dam from the Desert Princess. 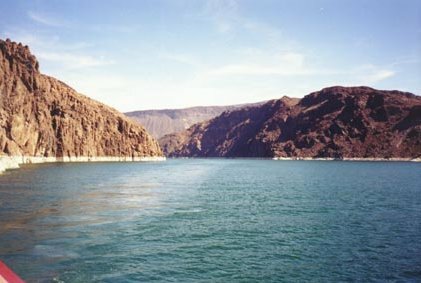 Here's the view from the Desert Princess near Hoover Dam looking back through Black Canyon toward Lake Mead. 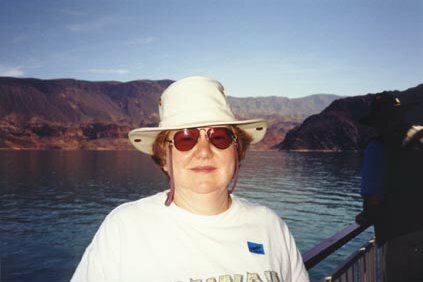 During the cruise, we learned that there are only three plants native to the state of Nevada, sagebrush, tumbleweed, and creosote bushes. Believe it or not, mountain goats actually live in this terrain eating these plants. Unfortunately, we didn't see any mountain goats. Shame. 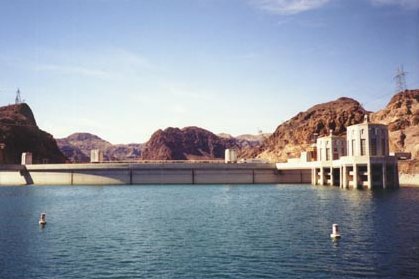 Here's Hoover Dam. Funny, but it doesn't look so tall from the lake side. 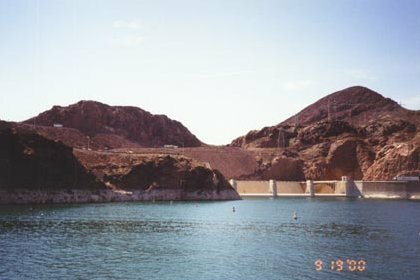 The Desert Princess takes us back to the bus so we can visit the dam and take the "Best Dam Tour You'll Ever See". 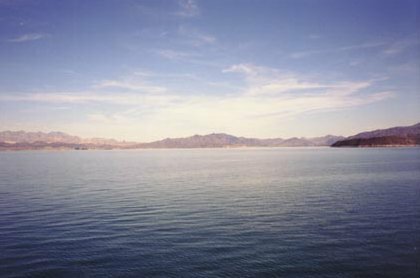 The placid waters of Lake Mead. to this page since November 21, 1999. Last revised: March 02, 2002.